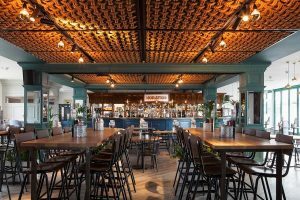 Hospitality design specialists DesignLSM have transformed one of Britain’s best loved tourist attractions, Brighton Palace Pier. Horatio’s Bar and Palm Court have been re-designed, to create modern all-day dining and bar experiences for local residents and tourists alike, to enjoy the splendid sea views. This iconic attraction has been featured in many works of British culture, including the gangster thriller Brighton Rock, and The Who’s album and film Quadraphenia. This cultural heritage been referenced in Horatio’s Bar with DesignLSM creating a destination all day bar and evening venue with a curated roster of live music, theatre and entertainment. The dated venue has been transformed into a cool, open and welcoming space. Bi-folding doors opens the bar out on to the terrace whilst the upholstered furniture and subtle nautical colour palette adds warmth and texture. Communal bench seating mixed with intimate booth seating, suspended woven rope ceiling, and antique brass features creates a social ambiance and provides a nod to the location and history of the space. Palm Court has been designed with families, locals and tourists in mind. The brief was to create a gastro pub feel whilst still referencing a traditional English fish and chip restaurant in a contemporary manor. Originally set up as a separate bar and restaurant, DesignLSM, opened the space up, allowing full views of ‘fun times’ on the pier. The material palette has created a light airy space -pastel tones mixed with natural raw materials including copper, wooden flooring and leather upholstered seating all contribute to a relaxed, contemporary atmosphere. The original bandstand has been converted into a feature seating area offering guests a raised platform to enjoy the sea views. References to Brighton itself have been subtly incorporated throughout the space; including a large bespoke copper wall installation of a ‘starling murmuration’, a regular sight for tourists at dusk around the pier. Palm Court’s main bar area has been designed to create a visual focal point to the space. The full 360° bar area allows more serving points for customers, whilst adding interest and intrigue with the addition of high gantries displaying an array of drinks from fine wines to unusual liquors and craft beers. 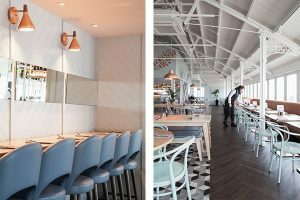 DesignLSM work with clients across the globe, but re-creating the F&B offer on the pier has been a project close to the heart of the Brighton based studio. These recent projects add to a great portfolio of work created for the City including The Salt Rooms, The Coal Shed and Chilli Pickle.